The Giant's Causeway is a mass of over 40,000 basalt columns on the NW coast of Ireland, between Portrush & Ballycastle; formed by a rapid cooling of lava hitting the sea. Folklore ascribes the formation to a mythical race of giants who laid down the rock on the sea floor as a roadway between the Scottish Hebridean islands and Ireland. 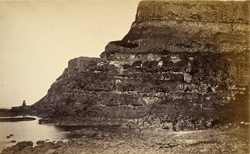 "The cliffs connected with the Causeway, and which constitute its grand features, extend from Portcoon eastward to Bengore Head, a distance, following the sinuosities of the shore, of three and a half miles, their height above the sea ranging from 140 to 390 feet; and of these Pleaskin, one of the highest, is the most beautiful, and affords the best views of this extraordinary coast. The summit of Pleaskin is covered with a thin grassy sod, under which lies the natural basaltic rock, having generally a hard surface, somewhat cracked and shivered. At the depth of ten or twelve feet from the summit this rock begins to assume a columnar tendency, and forms a range of massy pillars of basaltes, which stand perpendicular to the horizon, presenting, in the sharp face of the promontory, the appearance of a magnificent gallery of colonnade, upwards of sixty feet high. This colonnade is supported on a solid base of coarse, black, irregular rock, nearly sixty feet thick, abounding in blobs and air-holes; but, though comparatively irregular, it may be evidently observed to affect a peculiar figure, tending in many places to run into regular forms resembling the shooting of salts and other substances during a hasty crystallization. Under this great bed of stone stands a second range of pillars, between forty and fifty feet in height, less gross, and more sharply defined than those of the upper storey; many of them, on a close view, emulating even the neatness of the columns of the Great Causeway. This lower range is borne on a layer of red ochre stone, which serves as a relief to show it to great advantage. These two admirable galleries, together with the interjacent mass of irregular rock, form a perpendicular height of 270 feet, from the base of which the promontory, covered with rock and grass, slopes down to the sea for the space of 200 feet in height, which, in beauty and variety of its colouring, in elegance and novelty of arrangement, and in the extraordinary magnitude of its objects, cannot readily be rivalled by anything of the kind at present known."